Studio City, 3/10/1938: After the Flood. The 1938 Southern California Flood was one of the most catastrophic in our state’s history. In late February and early March, 5 inches of rain fell. At least 115 people died and over 5,600 homes were destroyed when rivers (not yet channeled in concrete) overflowed and buried buildings, bridges and automobiles in a tsunami of mud, debris and rapidly flowing water. The photo above is an aerial view of Studio City, aiming towards Universal, east of Laurel Canyon, showing the after-effects of the storm. 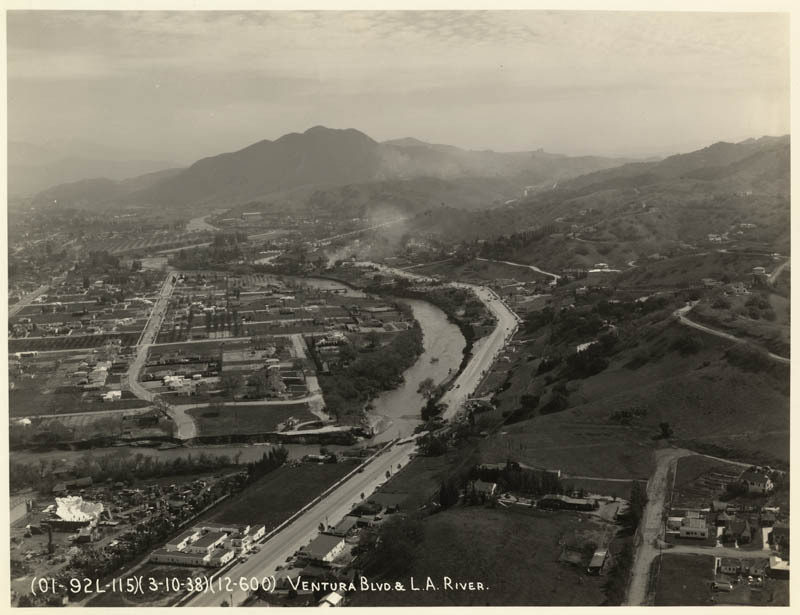 River bridges over Vineland, Tujunga and Colfax were destroyed. Republic Studios (CBS Studios) is in the lower left corner. Dilling St. snakes in an “L” formation from West to East river. Ventura Blvd. is the larger road. For those of us, who mourn not only the loss of life and property in 1938, the photograph provides a more elegiac and sad reminder of a time and place lost. The San Fernando Valley was once a much less crowded place of many fine homes on large lots, with farm animals- horses and chickens- surrounded by acres of citrus, walnuts, and avocados. Garbage was burned, without guilt, in backyard incinerators. People lived “green” without political intent. The hills were not yet defaced with billboards and ugly condos, and one could look miles across the smogless valley and see mountains. People had cars, but they also walked to corner markets, rode bicycles to school, attended movies in neighborhood cinemas, and left their doors unlocked. Nobody went to the gym; their lives were active and exhausting enough. After World War II, the deluge: massive development, poisoned air and water, freeways, and the plowing over of verdant groves. And today we live in a place where only our homes are sacred, but the public element is degraded.